NISAW 2018: Where are we on the Management of Lionfish? Since the first lionfish was spotted off Pensacola in 2010, panhandle organizations have been busy trying to control the spread of this invasive species. The story is well known to many… the lionfish is a voracious predator, consuming at least 70 different species of small reef fish, including vermillion snapper. They reproduce frequently, producing an average of 25,000 eggs/female every four days – and they breed during most of the year. The densities of these fish on our nearshore and offshore reefs are some of the highest in the South Atlantic region, and they prefer artificial reefs to natural bottom. We know they have spread across the northern Gulf to include all five Gulf states and are found in Mexican waters. We also know that the primary method of removal is still spearfishing. The state of Florida has an open season on them and provides a program to assist local divers with selling their harvest. There are several rodeo tournaments along the Gulf coast and some traditional fishing tournaments have created a category for them. Education programs about the problem continue and some restaurants have offered them when they can get them. Are we on top of controlling the lionfish? Anecdotal reports suggest we have made some impact. Local divers in the Pensacola area report that the shallower public reefs frequented by local divers and dive charters have indicated they are getting harder to find. There have been some tour trips, taking out of town residents diving for lionfish, where they have had to really search to find them. This is certainly encouraging and a numerical assessment of this is needed. However, there are also reports of charter fishing boats catching them on hook and line in deeper waters. They are not catching many, but they do occasionally grab them. When they do, it is usually on live bait and in deep water, 200 feet or so. Local divers seem to agree with this. They too find more lionfish, and some large ones, at depth – too deep to take a typical dive charter trip to remove. Recent research has shown that lionfish are able, at least in the northern Gulf of Mexico, to swim greater distances than once thought to re-colonize reefs that have been cleaned. One study showed that selected artificial reefs, which were completely cleaned of lionfish, had restored lionfish populations, both young and old fish, within a year. This same study suggests that to keep lionfish at relatively low-density (about 5 lionfish/100 m 2) reefs would need to be cleaned every two months. Several lionfish derbies occur along the Florida panhandle, but not at the frequency that may be needed to control re-colonization of shallower reefs by lionfish from deeper ones. Can we increase the number of derbies? Sure… but those who work on these derbies know the time and financial commitment required to put one on. It could happen that the number of local derbies would increase but we may have to think of other means of controlling lionfish. One idea is to increase the number who harvest commercially. To do so a diver would need to acquire a saltwater products license from the Florida Fish and Wildlife Conservation Commission (FWC). On their website, they provide the application and a list of approved buyers for the diver to contact. 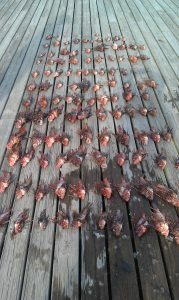 http://www.myfwc.com/Lionfish. One drawback to the commercial idea is the price. Currently divers require a high price for their catch in order to cover cost and show a profit. These high prices equate to high prices at local restaurants, higher than the public may be willing to pay. 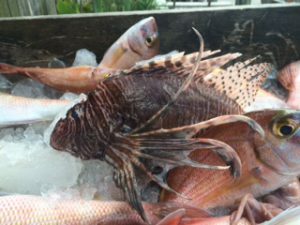 One unpublished study shows that some locals are willing to pay more for a lionfish dinner if they know it is helping the environment. Many seafood lovers understand the high cost of lobster, but have not placed lionfish in the same category and are not as willing to pay higher prices; this may have to change. Research continues on developing a lionfish trap that has low by-catch rates. If an effective trap is developed, they could be deployed from vessels, which would not require diving, and could bring prices down. There is evidence that populations of small reef fish have significantly declined since 2010. Whether this was due to the oil spill, the lionfish invasion, or a combination is still not certain. 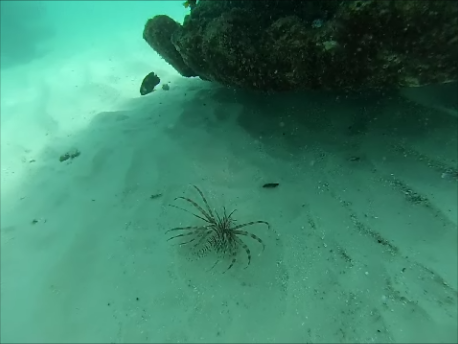 It is known that local reefs that are cleaned of lionfish are repopulated with both large and small lionfish. We have had some success with removing but we still have work to do. Dahl, K.A., W.F. Patterson, R.A. Snyder. 2016. Experimental Assessment of Lionfish Removals to Mitigate Reef Community Shifts on Northern Gulf of Mexico Artificial Reefs. Marine Ecology Progress Series. Vol 558. Pp: 207-221. Despite efforts by public and private land managers, feral hog populations continue to rise in many areas in Florida. Feral hogs damage crop fields, lawns, wetlands, and forests. They can negatively impact native species of plants and animals. Their rooting leads to erosion and decreased water quality. Let’s talk about these options. Hunting with dogs is really not very effective for removing enough hogs to control populations. Dog hunting can move sounders of hogs from areas where damage is occurring for a period of time. This can be helpful when crops need to be protected from hog damage until they can be harvested. Shooting hogs also is not effective for removing large numbers of hogs. Situations where it is successful include protecting crop fields and for taking hogs that will not go into a trap. Shooting success depends the education level of the hogs and the sophistication of the shooting equipment available. Hogs learn quickly to avoid danger. They learn by watching other hogs who get shot or trapped. Hunting pressure can disrupt hog patterns and make them harder to trap or hunt. Corral traps are shown to be most effective for eliminating complete sounders. By eliminating a sounder at once, populations can be reduced. Corral traps are also more economical. In the Auburn study, the trapping cost per pig for box traps was $671.31 and for corral traps was $121.28. Corral traps are best for capturing whole sounders. Box traps can be effective for capturing young hogs. When trap smart adult females or males are in an area, shooting or hunting with dogs are options. Just remember that hunting pressure often just moves the hog problem onto another property. 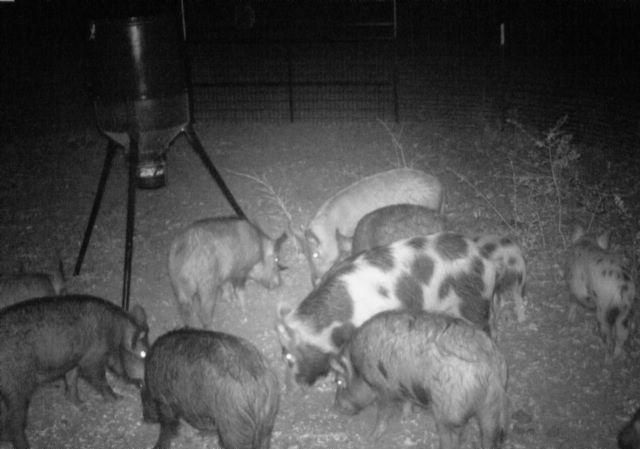 In order to eliminate hogs from a given area, we must employ several of these strategies. For example, we may be able to trap a sounder in a given area but still have a group of boars that will not go into a trap. In this case, we may set up to shoot them after trapping the rest of the hogs in a corral trap. By using these two techniques, we can drastically reduce the number of hogs in an area. For more information about feral hogs, go to http://articles.extension.org/feral_hogs. When you think of snails, you probably aren’t thinking about scary monsters that have been unleashed to terrorize us all. I’m here to warn you that you should. The channeled apple snail (Pomacea canaliculata) is a known agricultural pest that competes with native snail species. In our area (panhandle Florida, Hurlburt Field to be exact) this snail is consuming unknown quantities of plant material in our sensitive wetlands. If you didn’t know, Hurlburt Field Air Force Base is one of the last places on Earth where the endangered reticulated flatwoods salamander (Ambystoma bishopi) can still be found, and this endangered salamander relies on healthy wetlands and ephemeral ponds for breeding. So why should you worry? Just think about how snails eat: snails have a tongue (a radula) with teeth-like structures (denticles) they use to rasp or drill into their food. Normally, nobody would really worry about what snails are eating; they’re snails, right? But, here comes the scary part: when there are many snails, all eating and breeding and growing and eating, they consume a lot of material. And, what once was a cute little snail in your 10-gallon aquarium becomes a rampaging menace when you dump your tank out in the ditch next to your house and the snail escapes into the wild! 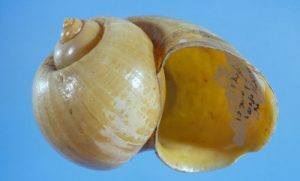 Channeled applesnail, Pomacea canaliculata (Lamarck, 1819). Photograph by Jeffrey Lotz, DPI. Click on the picture for more information on apple snails in Florida. Ok, let’s be honest, it’s not like snails are running wild. I mean, they’re as slow as…well…snails. But what we believe began as a dumped aquarium pet some years ago has become a large population that is expanding into our wetlands. Although it is currently not found in our salamander breeding ponds (whew! ), if we don’t do something to stop it, it soon could be. Here we are in Florida, where we have many examples of dumped or escaped animals that are breeding and growing and eating and breeding with no population control. This is one heck of a great example of an invasive species. So, what are we going to do about this creeping, slimy, menace? Well, in our case, we called our invasive species contractor, and this year we will begin a labor-intensive project to control this species’ population on Hurlburt Field. We could use your support! Please use the IveGot1 app or EDDMaps to report local encounters with channeled apple snails. And, please DO NOT release non-native wildlife into the wild! 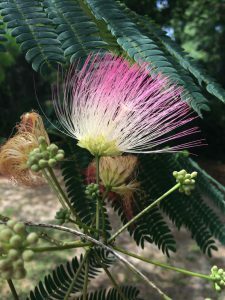 All along the roadsides and in home landscapes in summer, a profusion of fluffy pink blossoms are adorning trees known as mimosa, or Albizia julibrissin. This native of China was introduced to home landscapes in this country in the 1700’s to enjoy the fragrant, showy flowers and fine, lacy foliage. However, there is a dark side to this lovely tree. After blooming, it produces an abundance of pods each containing 5 to 10 seeds. 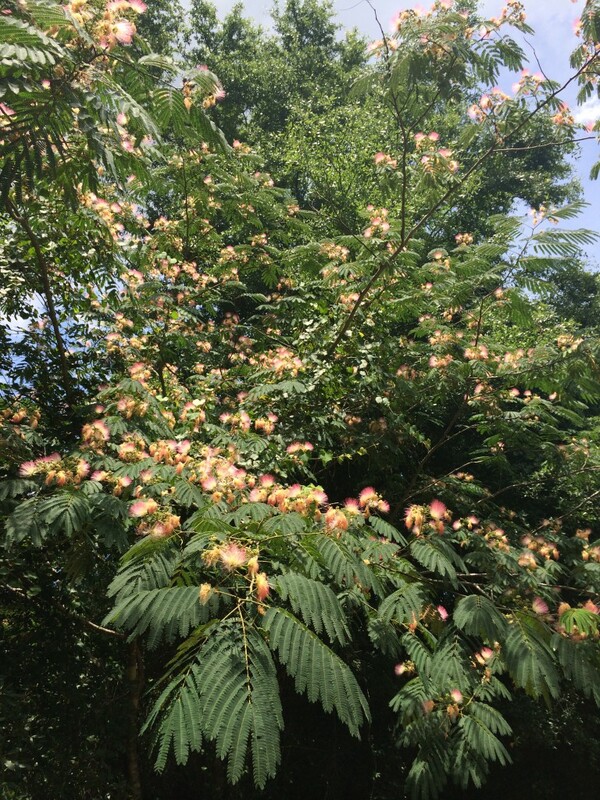 Seeds can be spread by wildlife and water; this is evidenced by the appearance of mimosa trees along the roadways, streams and in our natural areas. The seeds can also remain dormant for many years, allowing the trees to keep sprouting long after the mother tree is gone. 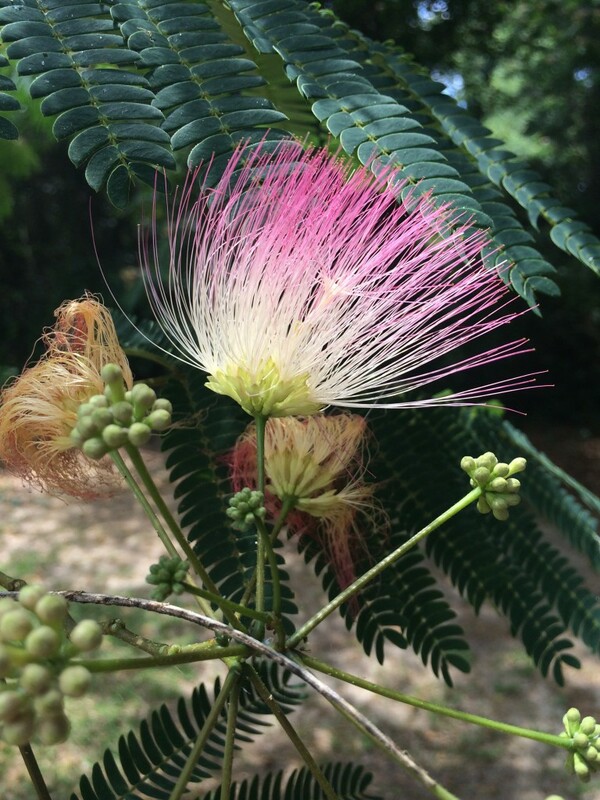 Mimosa has been categorized as an invasive exotic plant in Florida by the University of Florida IFAS Assessment of Non-Native Plants in Florida’s Natural Areas. This designation means that the tree has not only naturalized, but is expanding on its own in Florida native plant communities. This expansion means that our native plants in natural areas get crowded out by mimosa as it reproduces so prolifically. 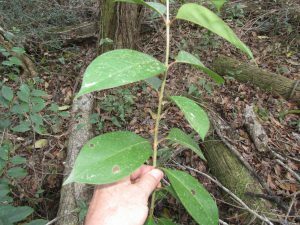 The Florida Exotic Pest Plant Council (FLEPPC) publishes a list of non-native plants that have been determined to be invasive. Click here for the most recent 2017 list! 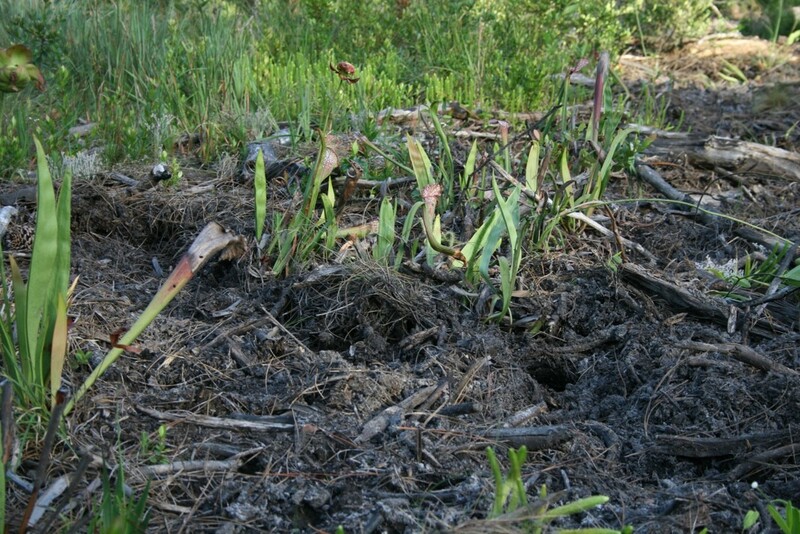 The first step in controlling this pest plant is to remove existing plants in the landscape. Cutting it down at soil level and immediately painting the stump with a 25% solution of glyphosate or triclopyr should do the trick. Further details and control methods can be found here. There are some native trees that make excellent alternatives to mimosa such as fringe tree (Chionanthus virginicus), silverbell (Halesia carolina) and flowering dogwood (Cornus florida). Keep your eyes open for this Category 1 FLEPPC invader. When the Florida Exotic Pest Plant Council deems a plant a Category 1, it means that the plant is capable of altering native ecosystems by displacing native species. Other common names for this Ligustrum include glossy privet and wax-leaf ligustrum, which are fitting descriptions of the large, shiny leaves arranged oppositely on the stems. 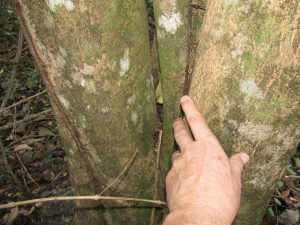 Belonging to the olive family (Oleaceae), this small tree can grow to 10 m tall and form a dense shady canopy above the forest understory. It has been documented in several Central to North Florida counties and has also escaped in Pennsylvania, Virginia, North Carolina, Texas, Georgia Alabama, Mississippi, Louisiana, Maryland, California and Hawaii, as well as other countries (K.A. Langeland, et al. University of Florida-IFAS Pub SP 257, 2008). 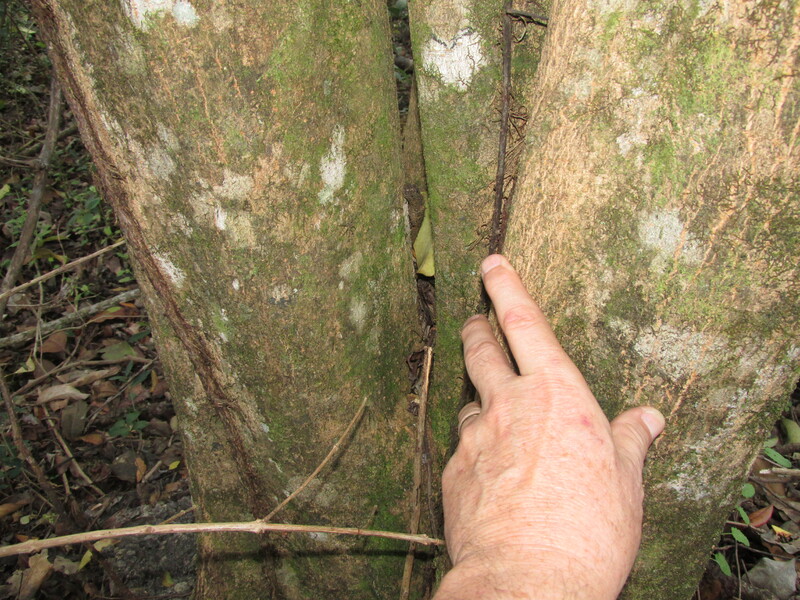 The typical growth pattern often involves multiple trunks with very smooth bark and twigs being dotted with numerous corky lenticels. Once a parent plant is established it will produce copious clusters of dark drupes that will blanket the understory with small seedlings in a short time due to very high germination rates. Birds are a likely dispersal mechanism also. 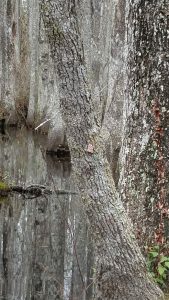 It prefers a mesic hardwood hammock setting in North Florida and when cut down, readily re-sprouts with many new stems from the trunk. An herbicide application to stumps is a must for control. These plants can gain an advantage in many ways in our native habitats. They tend to be salt tolerant and are able to withstand fire well. They can grow in acidic to alkaline soils but do not do well in wet soil conditions. They will commonly colonize river banks though where the higher levees provide a deeper, sandier footing. There are two other non-native ligustrums established in North Florida also but they are easy to separate if you look closely at the foliage. The plant commonly called Chinese ligustrum (l. sinense) has much smaller leaves. The more similar looking Japenese ligustrum (l. japonicum, also called wax-leaf privet), can be distinguished by the lack of a thin translucent margin along the leaf edges. This is easy to see if you hold a tree privet leaf against a backlit setting.